If you watch one thing this week please make it The True Cost. It’s streaming on Netflix right now, which is where I ran across it. This powerful documentary shows us the real cost of our clothes – the disregard of worker rights, the environment – all for cheap, disposable, trendy fashion (fast fashion). This movie opened my eyes to how much I am contributing by purchasing from environmental and socially irresponsible companies. I did some more research and found lots of great blogs including Life, Style, Justice that has this wonderful guest post on the garment industry. Thankfully, it’s easy to change the way we shop! From this day forward I will strive to have at least 80% of my clothes come from ethical companies. I will define ethical companies as companies that use at least one if not more of the following: organic fabrics, fair trade practices, socially responsible factories, USA made, and donations to social/environmental causes. I plan to continue my Five Piece French Wardrobe Challenge, because I believe that having a small wardrobe is also an important step in a sustainable direction. 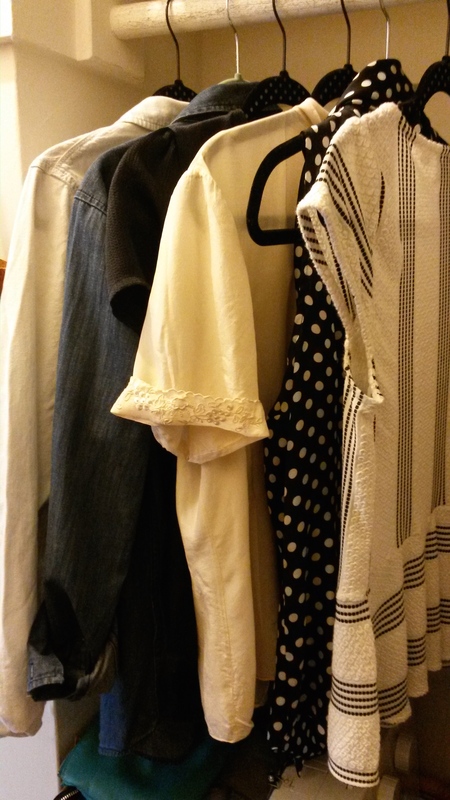 The tools I learned here about a minimalist wardrobe are still completely relevant. I’m now three months into my Five Piece French Wardrobe challenge. Already I’ve learned so much that I wanted to share. Embrace your own style. I don’t like those posts about the items that every woman should have in her closet. We are all different in our style, so why should we conform to one checklist of clothes? I had a black blazer in my closet gathering dust for 6 years. I never removed it because I believed it was a staple I needed; I must have read this countless times in fashion magazines. The worst part is that I didn’t even buy it – it was a hand-me-down from a friend and I still couldn’t bring myself to part with it. But once I was finally honest with myself and admitted it was something I would never wear, removing it from my closet became a liberating experience. My closet was closer to representing me and less of what I thought I had to be. The more I embraced my own style the happier I became. Investing in quality items doesn’t have to be financially daunting. I thought that my switch from fast fashion (Forever 21, H&M etc) to quality fashion was going to cause me to spend more. But I’ve been surprised at how many quality items I can buy on sale. For instance, I buy all my jeans on sale so none of them are over $40. This spring I got a gorgeous sweater from Lucky during their blowout sale for $10 even though it was originally $100. And good finds are not just in the sale section. 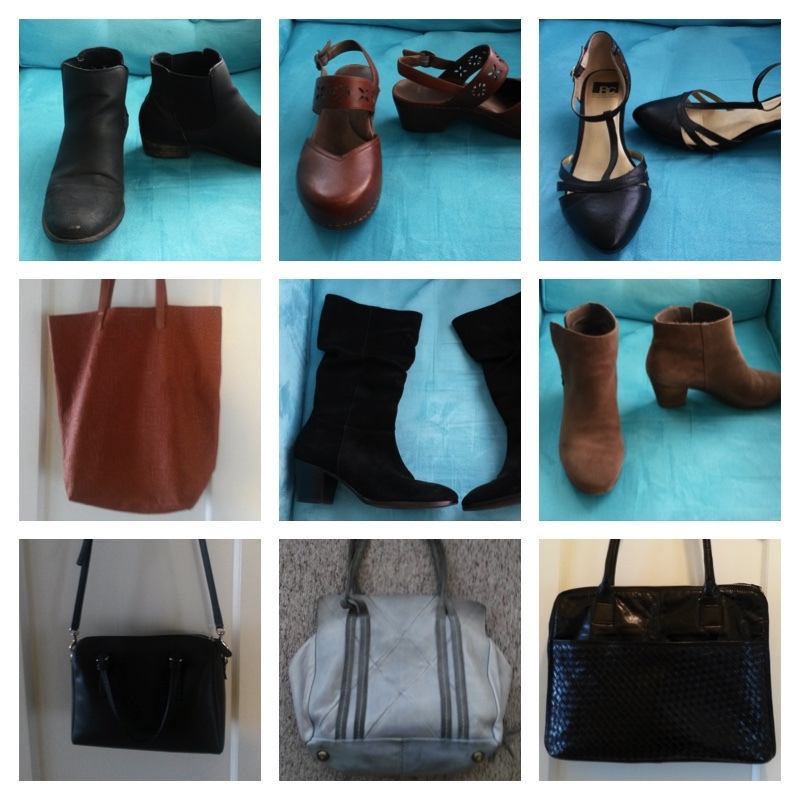 Check out thrift and consignment stores. I found a brand new, unworn, pair of Madewell boots (that retail for $230) at my local consignment store for $45. Sometimes you may get in a style rut. 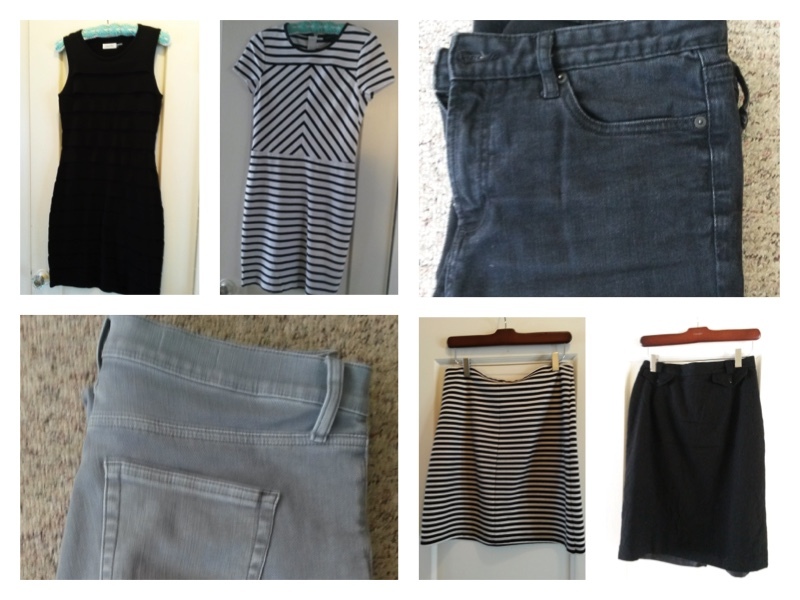 After investing in some quality basics I was tickled by how small and versatile my wardrobe was. But then I started to wear the same striped shirt, jeans and faux leather jacket every day because it was easy and comfortable. I realized that with a small wardrobe you have to maintain the motivation and creativity to make your style shine through. Otherwise it’s easy to starting looking pretty monochromatic. So maybe I could wear those jeans and striped shirt every day but I needed some other pieces to make the outfit reflect my own style. But even though this was a hard hurdle, overall…..
Blue summer dress (Goodwill, $10): I love how light and flowy this dress is. Plus it has a vintage feel, with a cut similar to 1940s tea dresses. Bathing suit (Aerie, $$50): I bought this top because it offers a little more coverage. No accidental flashing everyone at the river when jumping off a rock! I also wanted a pair of high waisted swim bottoms. In theory these seem perfect because you can adjust the height. I am going swimming this weekend so I will test how functional they really are. 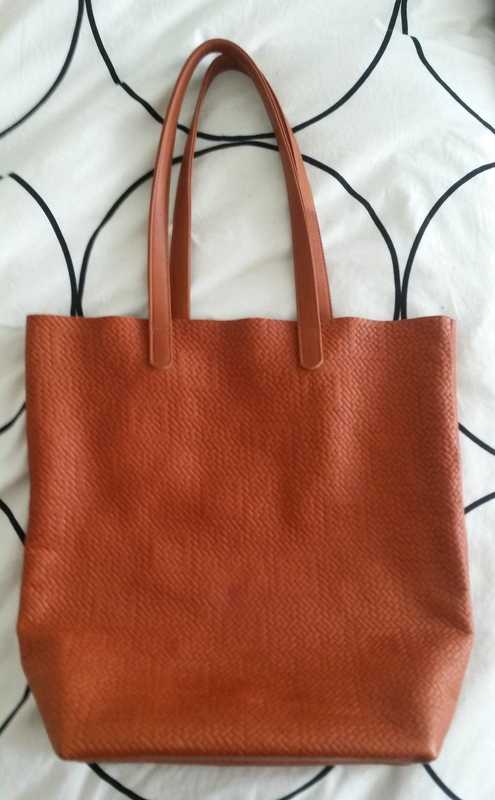 Baggu leather tote (Urban Outfitters, $100): The brown leather tote craze hit SF (and the blogging world) hard and I admit that I wanted part of the action. But the one that every woman has is the Madewell Transport Tote, and while it’s beautiful it is also HUGE! Even similar totes at Banana Republic and J Crew are really too big for me (what am I suppose to bring in them, I don’t get it?!). I guess I don’t cart a lot of stuff with me in my purse. It took a while to find the perfect brown tote, but when I saw this one online for 50% off I knew it was worth a shot. It’s much narrower that the Transport Tote and it has a basket weave design. Plus it’s the most gorgeous orangey brown color. I’ve really fallen in love with it, and I like that not every woman has the same tote as me. I love it so much it’s become one of my basics. 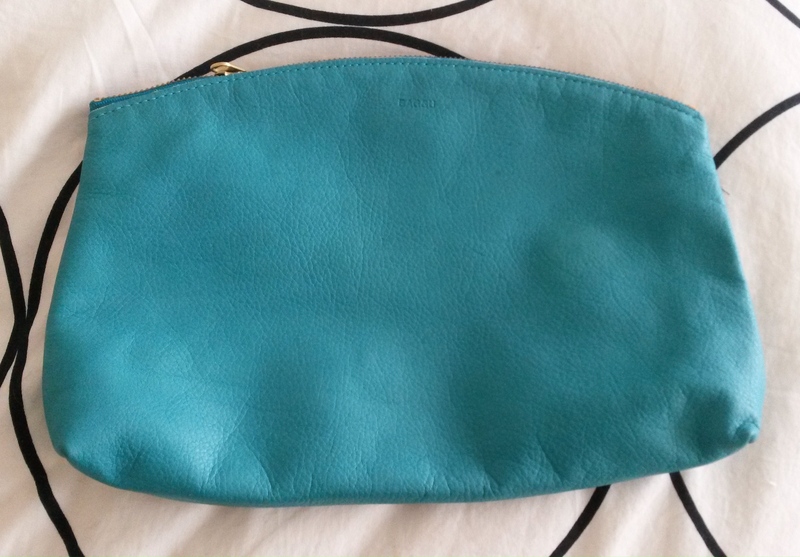 Baggu leather clutch (Baggu, $16): After having such a positive experience with the Baggu tote, I thought I would try their leather clutch too. I found it on super sale, and while I like it, I don’t think I would buy it full price ($54). It’s fun but hasn’t been too practical yet. 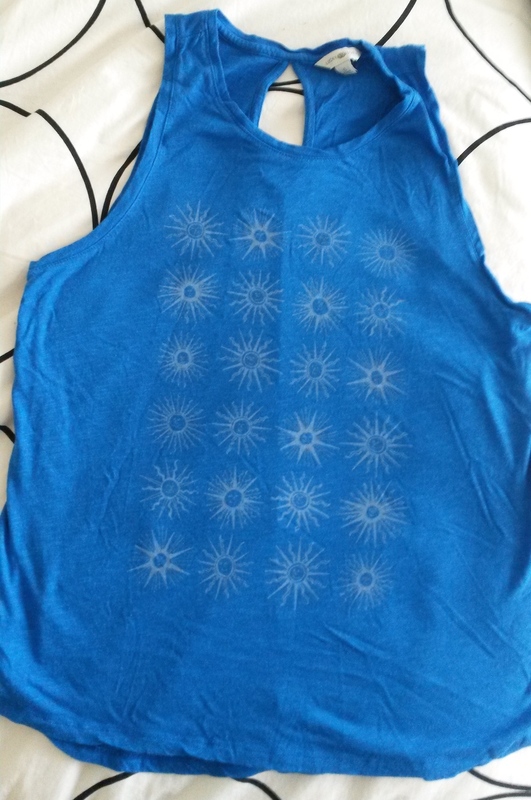 Blue billowy tee-shirt (Lucky Brand, $14): I wanted a bright oversized t-shirt that I could wear to the pool or to the beach. It’s a simple shirt but it provides a jolt of color to my monochromatic basics. Overall I’m happy with my 5 purchases. But only buying 5 items for 6 months is more challenging than I thought. There is a lot of self restraint! This is my first seasonal collection and I bought all the items within a month of each other and right at the beginning of spring. I realize now that this was not the best way to do it. I’m thinking that in the future I will space my purchases out and buy a few of them later in the season. This last year I’ve become increasingly interested in the concept of a minimalist lifestyle, something that has gathering steam with blogs like The Minimalists, Becoming Minimalist and miss minimalist. But creating a home centered around simplicity has proved to be a much easier task than downsizing my closet. My large walk in closet, coupled with living in a city with great fashion at my fingertips, has left me with an ever expanding wardrobe and ever shrinking wallet. This last winter I made efforts to purge roughly 30% of my wardrobe. Granted, I felt liberated by having less stuff yet I haven’t gained a better awareness of how to maintain this small wardrobe. There are tons of articles about reducing your wardrobe but after you’ve succeeded, what’s next? Fueled by this question, I spent many an hour on Pinterest looking for answers. 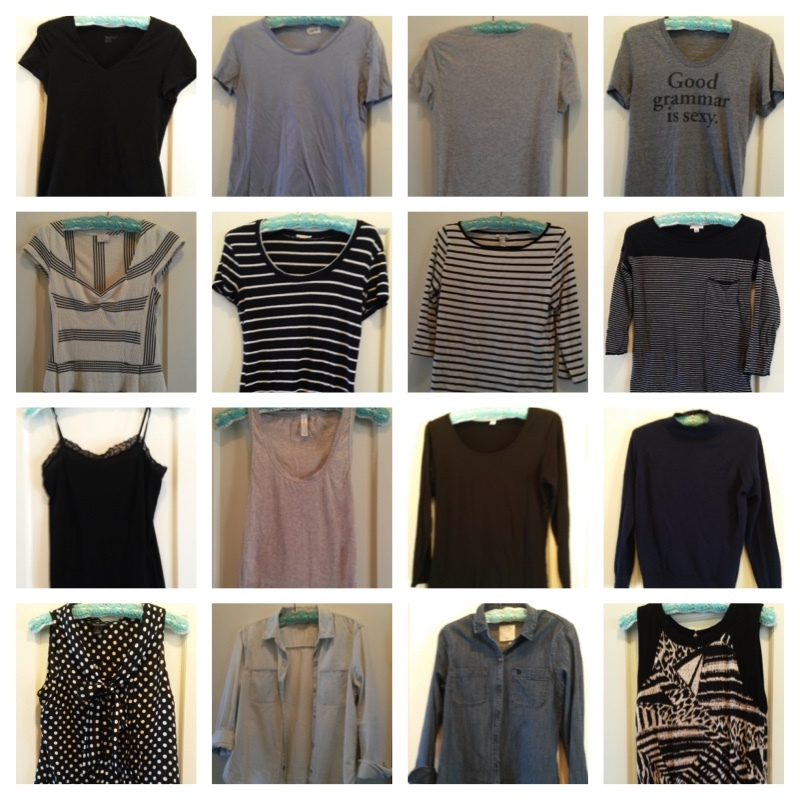 I learned about Project 333, also known as the Capsule Wardrobe. While I love this idea, it doesn’t feel like the right fit for me. Everyone has a different lifestyle and location where they live, so no one wardrobe tool will work for everyone, right? The concept with a capsule wardrobe is that every season (4 seasons a year) you put together 33 or 37 pieces (the number can vary depending on who you talk to) for those 3 months. Caroline of Un-fancy made the capsule wardrobe look effortlessly cool. But my biggest roadblock is that I live in a place that is characteristically unseasonable. 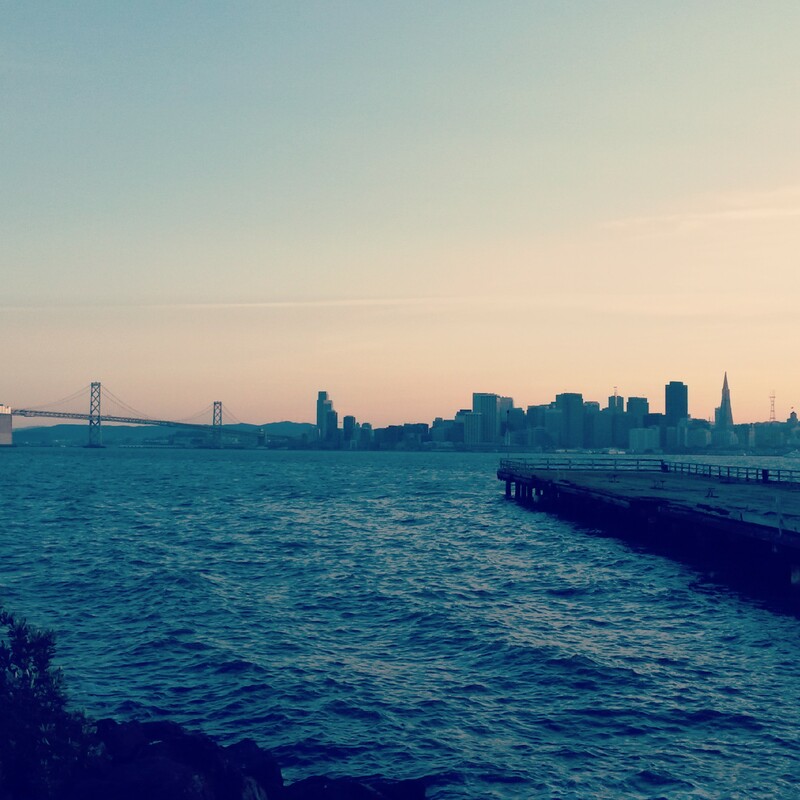 In San Francisco I tend to wear the same clothes in winter that I wear in summer. There are some variations – especially the colors I choose to highlight depending on the time of year – but my wool coat is never retired from my uniform. The other obstacle with this program is that there are no strict rules to how many items you can buy a season for your capsule collection, just the general assumption that you will strive for less. When I read about bloggers dishing out over $500 a season for new items, I knew that there was not enough structure for my shopaholic nature. After all, this isn’t just a project in downsizing my wardrobe, I also want to start saving money that previously went to shopping. Just recently I came across the Five Piece French Wardrobe (how did I miss it when it first gained popularity a few years ago?). The concept is that you build a wardrobe of quality basics – some people give a number to how many basics you can own, others don’t. Then you restrict yourself to buying only buy 5 items per fashion season, and there are only two seasons: spring-summer and fall-winter. 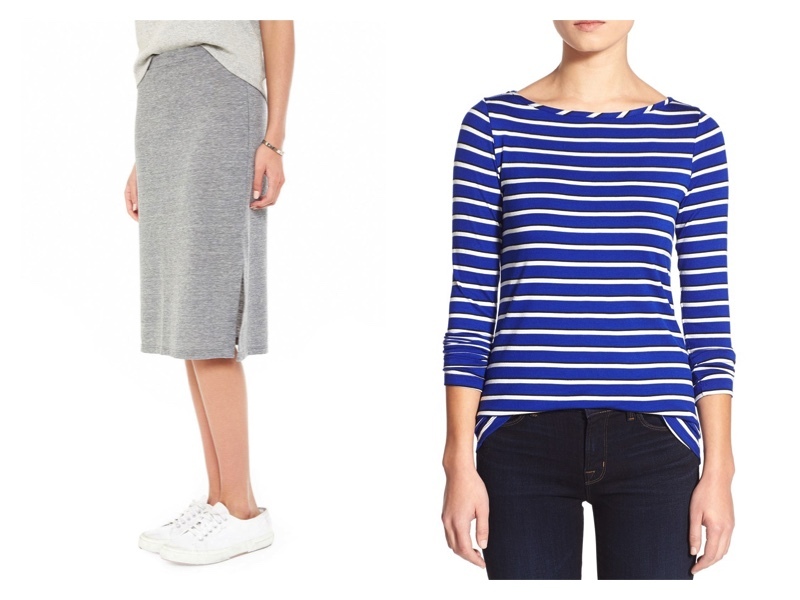 These 5 items can be trend based…..think of them as your embellishment pieces to liven up your basics. 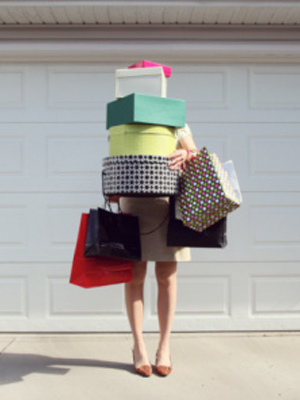 Throughout the year you can replenish your basics if an item is in disarray. The emphasis is placed on a wardrobe of quality items over quantity. 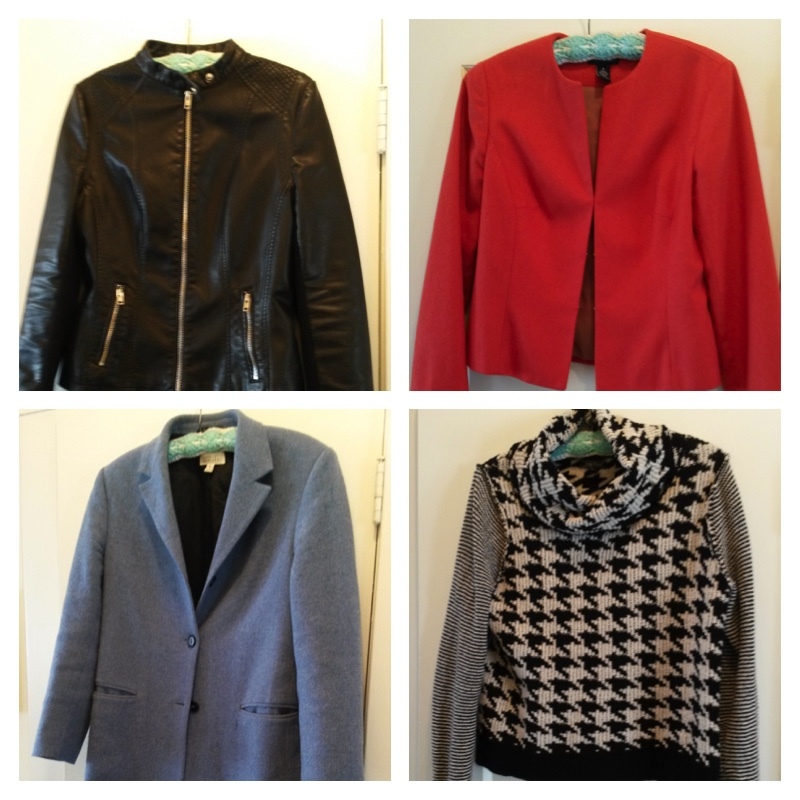 I excited about the Five Piece French Wardrobe (FPFW) and have decided to try it out and blog about it here. It seems like this idea is so much more conducive to living a place where the seasons are not pronounced. 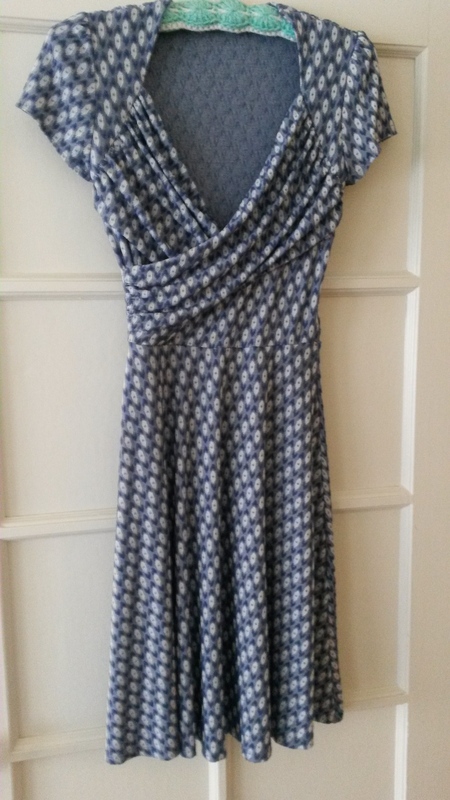 Also I am more of an impulse shopper, drawn to an item because of its unusual print or to a cute summer dress without thinking about the fact that I already have 10 cute summer dresses and I live in SF, land of fog. 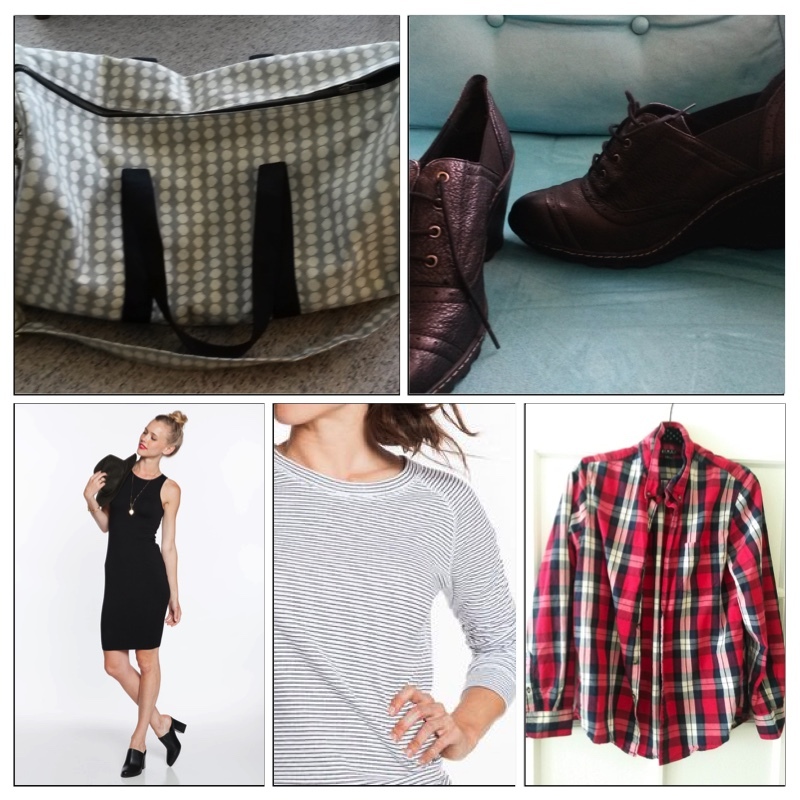 My hope is that committing to the FPFW will help me to streamline my wardrobe and learn to shop with intent.